BIGWIII is the third edition of the annual summer workshop on themes in geometry. The previous two conferences studied "Higgs Bundles" (BIGWI) and "Singularities and Symplectic Topology" (BIGWII). 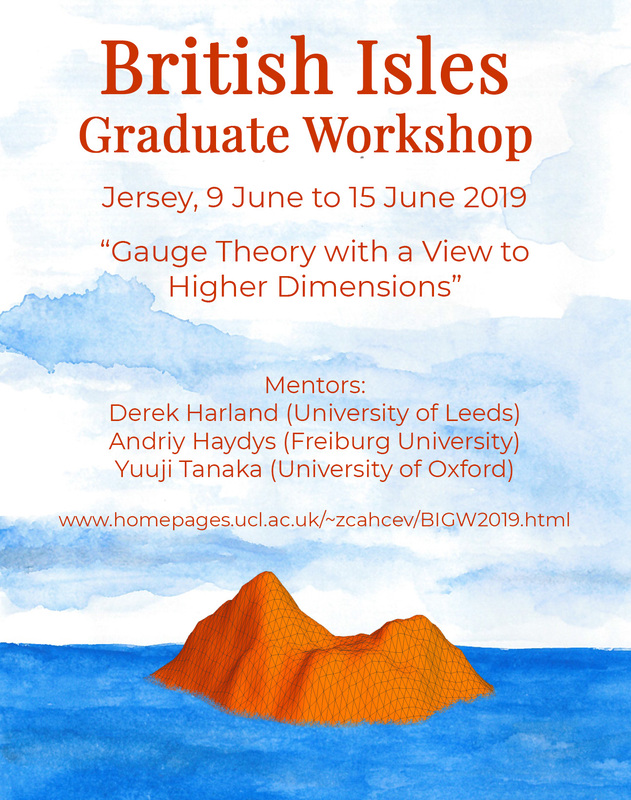 The theme of this workshop will be "Gauge Theory with a View to Higher Dimensions". The workshop will be held in Jersey from June 8th to June 14th, 2019. The goal is to bring together a group of approximately 25 graduate students to work on a specific topic under the guidance of three senior mathematicians. The majority of the talks will be given by the participants, and there will be time in the afternoons and evenings for further discussions and more informal sessions. The character of the workshop is expository in nature, starting with the basic ideas and leading to a survey of the most recent developments in the field; no prior knowledge of the topic will be assumed. Since both the participants and the mentors will be living in the same building, we hope to create an informal, yet mathematically intensive, atmosphere. The schedule of the workshop will be available nearer the time. Among all the participants, we expect half of them to give one of the scheduled talks, which will be allocated by early May 2018. Note that on July 8th and 14th no talks are scheduled as these days will be used for travel to and from the venue of the event. The location of the workshop will be the Durrell Wildlife Hostel on Jersey. Please arrive by 5pm on June 8th, and leave anytime on June 14th. The house is on the site of Jersey Zoo (founded by Gerald Durrell). The island has lots of beautiful beaches, as well as places of natural or historical significance, and there will be some free time during the workshop to allow for exploration. The easiest way to get there is probably by plane to Jersey airport (there are regular flights from many UK airports). There are also boats from England or France, but they take longer. Then it is not far from the airport to the hostel, and you can either get two buses or a taxi. The local expenses for all participants will be covered by the workshop, in particular the costs of accommodation and meals. There will be a registration fee of £80. We strongly encourage female applicants, and are committed to redressing the gender imbalance in mathematics at research level. Applications for this year are now closed. Thank you to everyone who applied. Emails have been sent to all applicants. If you applied but didn't receive an email, please contact one of the organsisers. For questions or suggestions, please send an email to the organisers at benjamin.aslan.17@ucl.ac.uk. We gratefully acknowledge funding and support from the EPSRC Centre for Doctoral Training in Geometry and Number Theory, Heilbronn Institute for Mathematical Research, University College London and Simons Collaboration on Special Holonomy in Geometry, Analysis, and Physics.